Missoula Out here off-the-grid with my grown son, we pass for each other’s adult supervision. We still keep an eye over our shoulders though. All of a sudden he grabbed a broom, and he swept the Airstream yesterday with the comment that his mother “wouldn’t have been happy looking at these floors.” It rained in the mountains off and on from about 5pm on last night, so we were tracking in a good bit of the ground cover and pine needles with us undoubtedly. This is the second time he and I have come out here without the rest of the family. In 2011, we thought the weekend before Memorial Day was a good idea and found ourselves in the trailer without heat or propane caught in snow and hail for a couple of days. We should have expected rain or something this time, but at least when lightening broke over Rock Creek, we hightailed it to the Silver Bullet bringing the ground cover with us. We’re well trained, just not well behaved. The quiet gets you thinking though. Right before I left New Orleans, some folks came over to the office and filmed me telling a couple of one-minute stories for something called the Moth. These stories go on the air and on the web with public radio from what I gather, so mine may be headed for the cutting room floor or the vast maw of the media. You never know. I told three quick stories though from the 1970s. The first was the Memphis March in 1978, and how the ACORN members got by the phalanx of cops and ended up banging on the plate glass doors. The last was about negotiating with Arkansas Governor Winthrop Rockefeller in 1970 and one of the leaders, the late great Gloria Benson Wilson, in a dramatic moment pulled off her wig and claimed to the Governor that the stress of welfare had made all of her hair fall out. The middle story was one of those family stories of the “how I met your mother” variety. I was passing through Memphis in order to catch a US Air flight in 1979, when their great Liberty Fares were a key part of ACORN’s organizing expansion program. For a fixed amount you could fly an unlimited number of flights anywhere in the US Air system for 14 days. We milked those tickets for ever mile, switched them at airports and almost midair between ACORN travelers, and mourned their passing. I was staying with the head organizer that night, and one thing and another, we woke up at 6:40 AM and my flight left at 7:00 AM. We bolted out the door, and she ran her mother’s old four-holed Buick at 70 and 80 mph down Fair Park Boulevard screeching to a halt in front of the airport. This was long before 9/11 and airport security was very different. Wordlessly, I grabbed by bags and we both ran down the concourse to the gate. Reaching there, the gate attendant waved that the door was locked and the plane had just left. I ran for the door, and began banging, “Let me in!” Without breaking stride she ran down the steps to the tarmac and starting waving her arms and yelling up to the pilot to come back to the gate. Damned, if he didn’t, the door opened, and I was off to Philly with only one thought in my foolish head: that’s the girl for me! And, that’s been the case for almost 35 years now! The song has another line that also reminds me of my companera. When you’re struck by dumb luck like I was in the Memphis Airport at least be as smart as I was to grab the lightning bolt and never look back. 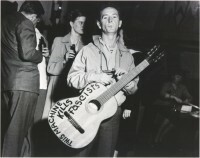 This entry was posted in ACORN, Personal Writings and tagged memphis, Woody Guthrie by Wade. Bookmark the permalink.